Southwaite Green Farm01900 821055work Self-cateringSouthwaite Green is a development of 4 properties that were developed in 2007 by the owner, who lives on site, to an extremely high standard. Local craftsmen, local timber and stone from the site have retained the traditional character including recycling original beams from the barn. 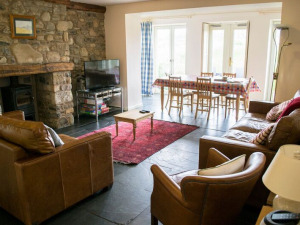 The cottages have used green design and technologies with ground and air source heat pumps to power the under-floor heating beneath the slate and oak floors. Solar panels generate both electricity and hot water. Great attention to detail has been paid to ensure that these are eco-friendly properties, including organic bedding and towels, hand-made furniture from sustainable sources, and 10 acres of organically maintained grounds. The owner has gone to great trouble to ensure the properties have a low carbon foot-print and to ensure your holiday is an enjoyable and memorable experience. The development briefly comprises two, 2-bedroom/2 shower en suite cottages, Skiddaw and Esther’s Barn. Buttermere is a ground floor 2-bedroom cottage which is specially adapted for disabled use with mobility 1 and 2 rating and Beckside is a 3 bedroom, 3 bathroom house. The properties have been given the much acclaimed Gold Award from the Green Tourism Scheme as well as 5 stars from VisitEngland. Situated in the Vale of Lorton, with Cockermouth and Lorton both 2 miles away, Keswick is 9 miles to the east, and within a short drive are the less frequented western lakes - Crummock, Loweswater, Buttermere and Ennerdale. There are ample walking and cycling opportunities from the door and a wealth of independent shops and restaurants can be found in both Cockermouth and Keswick. The properties sit on Paddle Beck with young woodland, wildflower meadows, pond and arboretum in the grounds. It is a great place for wildlife including deer, foxes, red squirrels, brown hare, badgers and many bird species including the occasional kingfisher. Southwaite Green Farm offers weekly bookings starting on Friday and Saturday and sometimes short breaks. Two bedrooms, one with twin beds that can be put together to make a super king size, 2 en suite shower rooms, open-plan kitchen, dining, living room. Extra folding bed suitable for child if required. 94 square metres. Esther's Barn offers weekly bookings starting on Friday and sometimes short breaks. Two bedrooms, one with twin beds that can be put together to make a super king size, 2 Shower rooms, open-plan kitchen, dining, living room. Extra small folding bed suitable for child if required. 103 square metres. Skiddaw offers weekly bookings starting on Friday and sometimes short breaks. Southwaite Green is a development of 4 properties that were developed in 2007 by the owner, who lives on site, to an extremely high standard. Local craftsmen, local timber and stone from the site have retained the traditional character including recycling original beams from the barn. The cottages have used green design and technologies with ground and air source heat pumps to power the under-floor heating beneath the slate and oak floors. Solar panels generate both electricity and hot water. Great attention to detail has been paid to ensure that these are eco-friendly properties, including organic bedding and towels, hand-made furniture from sustainable sources, and 10 acres of organically maintained grounds. The owner has gone to great trouble to ensure the properties have a low carbon foot-print and to ensure your holiday is an enjoyable and memorable experience. 10 acres of landscaped grounds Short tennis/badminton grass court Children welcome from any age. Please exit the M6 at junction 40 and take the A66 West to Keswick and Cockermouth. Continue for 30 miles to the roundabout and turn left towards Egremont on the A5086. Travel along this road for a short distance until you come to the rumble strips; then turn left at the crossroads at the bottom of the dip, by Paddle School. Continue along this road as it bends sharp left: Southwaite Green is several hundred yards on the left.